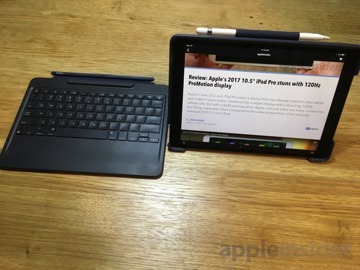 The latest option in the slowly growing lineup of iPad Pro Smart Connector accessories is Logitech's new Slim Combo keyboard, which offers the convenience of a physical keyboard with the ability to easily detach and use as a tablet. AppleInsider offers a closer look. 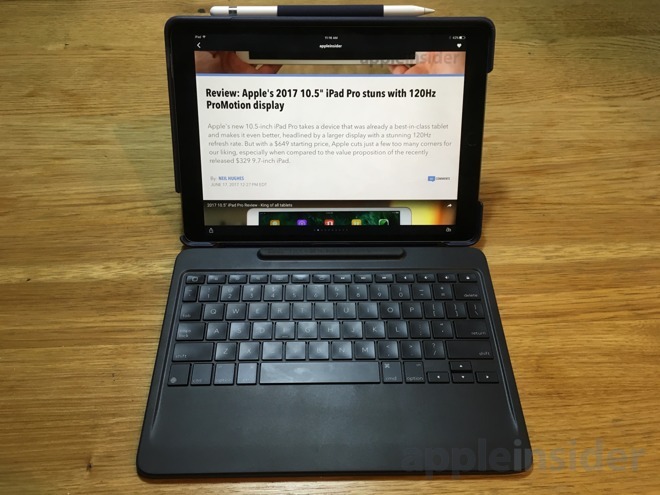 In Logitech's first take on a Smart Connector keyboard, the Logitech Create, the keyboard and rear iPad case were permanently attached, making the iPad more of a laptop replacement. 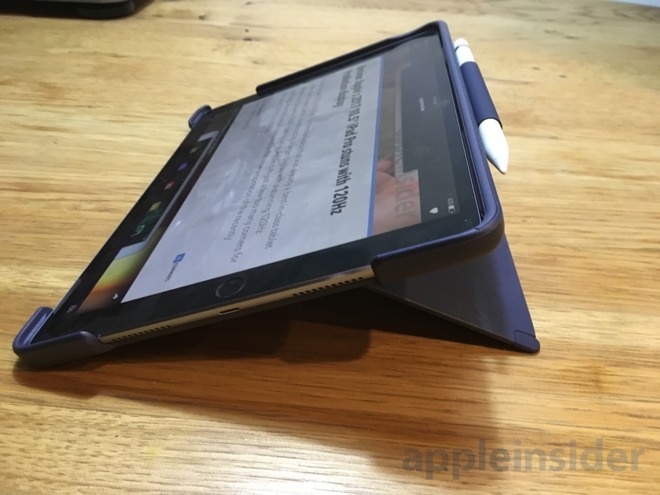 This time around, however, Logitech's Slim Combo has made efforts to retain the option of tablet-only mode by making the iPad and keyboard detachable. 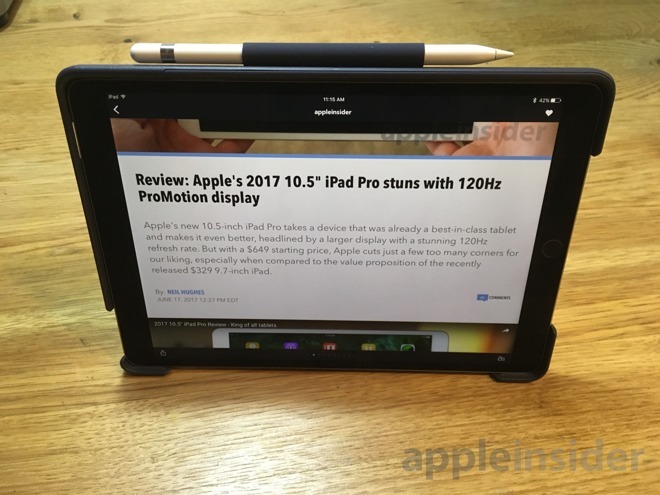 In addition, the Slim Combo is specifically designed for Apple's 2017 iPad Pro update, with a 10.5-inch version specifically designed to fit Apple's new form factor. 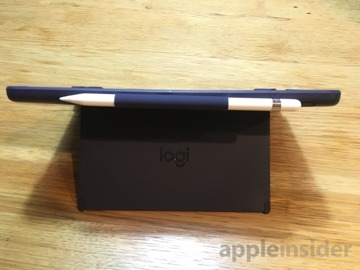 They come in black or blue, and are priced at $129.95 for the 10.5-inch version, and $149.95 for the 12.9-inch. 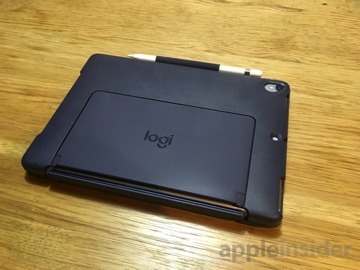 Logitech provided AppleInsider with a blue 10.5-inch version to test with the iPad Pro. 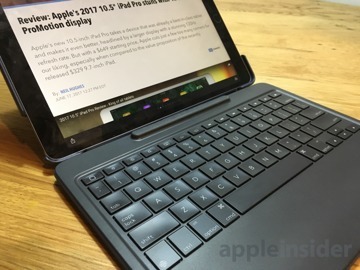 Notably, the smaller variant has a stiff, solid, hard plastic keyboard on the base, while the 12.9-inch model can be folded underneath the keyboard. Construction is light and solid. The keyboard has a cloth, textured back that should help it grip when used on a table or a lap. The keys are backlit, and because the keyboard is powered by the Smart Connector, there is no battery and no need to recharge. Up top, the keyboard adds a row of function keys, including a ahome button, brightness control, search, media playback, volume and lock. Underneath, it's a slightly undersized physical keyboard, still comfortable enough to type for touch typists. 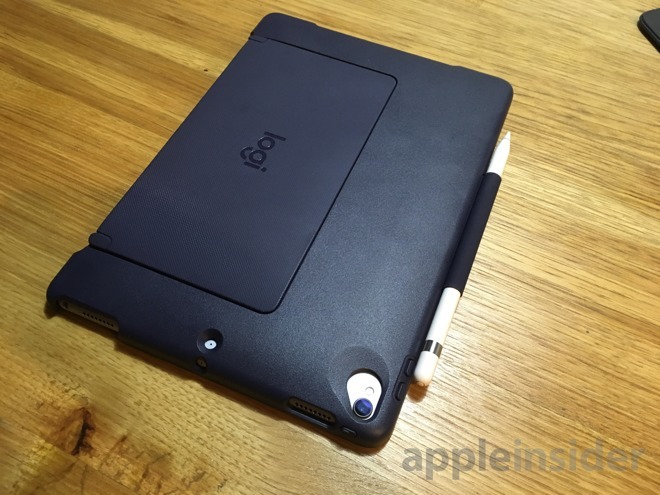 The second half of the device is a hard plastic case that covers the back of the 10.5-inch iPad Pro. 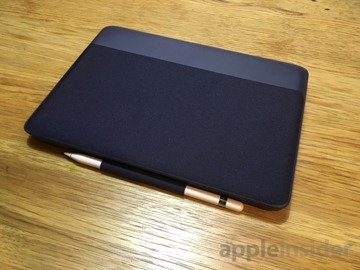 It has all of the cutouts you'd expect for speakers, cameras, microphones and connectors, as well as a handy loop to hold the Apple Pencil up top. Most notably, the case has a very sturdy kickstand on the back that can be adjusted to the user's liking with 50 degrees of tilt. 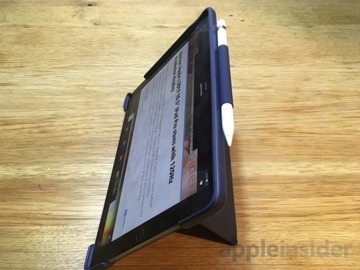 We appreciate how solid the kickstand is and how much variety if offers in displaying the iPad. Because the case and keyboard are separate pieces, users can detach the keyboard if they choose, and just use their iPad for reading or drawing. Because the kickstand is attached to the case, it can still be used without the keyboard attached. The front of the case has a noticeable lip around the perimeter, which allows it to clamshell like a laptop and lock the iPad Pro screen when closed against the keyboard. The lip is absent along the left border of the case, allowing users to hold the iPad with one hand without the lip in the way, while still controlling the device with their other, free hand. 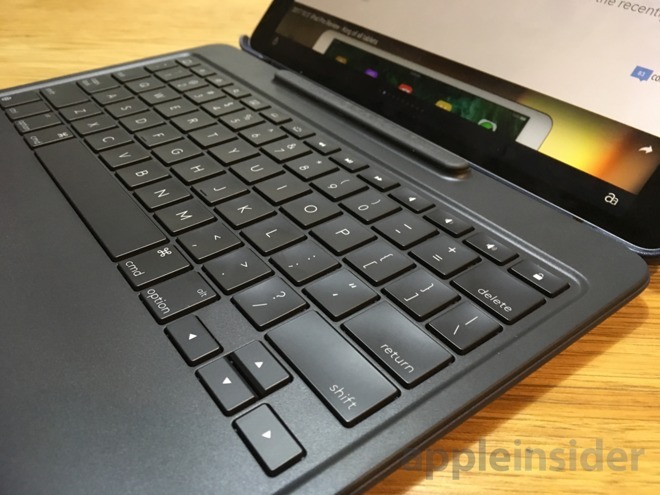 AppleInsider will have much more on the Logitech Slim Case keyboard for 10.5-inch iPad Pro in our full review.